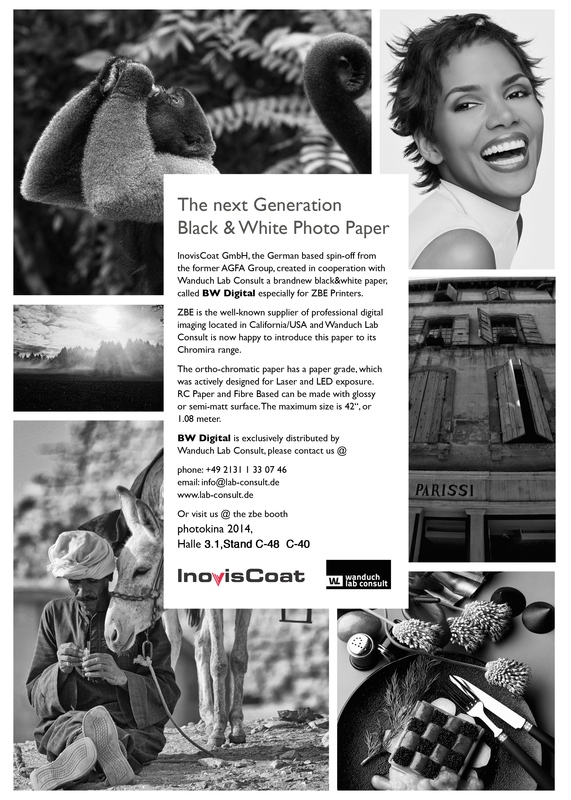 BW Digital is the latest photo paper for black & white photography – developed by InovisCoat. It was designed for the special needs of ZBE printers and together with Wanduch Lab Consult optimized for his Chromira range. its easy handling in all known black & white processes together with being suitable for all imaging technologies. BW Digital is especially designed for the imaging with Laser or LED. The paper is available with glossy or semi-matt surface up to a maximum size of 42’’ (1.08m). It’s exclusively distributed by Wanduch Lab Consult. Visit him at the photokina 2014, Halle 3.1, Stand C-48 C-40. The development of this new black & white technique was only possible through the long experience of InovisCoat in photography combined with its unique multilayer coating technology. For example for <<the-impossible-project>> we made the impossible possible! Starting with the aim to safe Polaroids from oblivion Impossible wanted us to ensure the production of Polaroid films. From that point on InovisCoat revolutionized the whole Polaroid system. Through our complete new development we could increase the overall quality of the photographic films dramatically. In addition we were able to adapt these systems to the current health and environmental regulations. This successful joint venture opened the chance that we still can take photos with Polaroids today – by achieving real high quality results! This is just a small cut-out of our wide photographic know-how. Many other projects like color-negative films show the broad product range and innovative power of InovisCoat in this market. Do you also dream of a very special photo, but you miss the material to make it real? Let’s develop it together!